Top webcams Acapulco (Mexico) in real time! Webcams Koh Samui allow in real-time to enjoy the stunning views of this tropical island located in the western part of the Gulf of Thailand. The island is relatively small, but the number of online webcams in Samui can envy a massive resorts of Thailand. The convenient location of many webcams allows everybody to enjoy not only the beautiful beaches of the resort and the pleasant greenery of palm trees and various exotic plants, but and active life, which flowing on this tropical island. Currently you can find on the page more than 10 original webcams Ko Samui, which undoubtedly will please you during your view. For your convenience, I have placed the windows with online broadcast Samui webcams in the following order: first there are cameras that are aimed at any natural attractions: the beaches of Koh Samui, the beautiful views of the sea, palm trees, mountains, etc. Rounding out the collection of a few webcams that allow watching live the life of people on the island: on the resort’s streets, in bars, hotels etc. 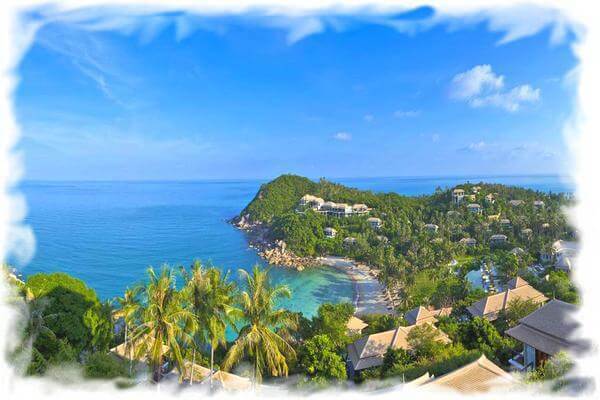 On this page I have tried to gather all the best webcams in Koh Samui available today that offer an acceptable image quality and stable operation around the clock. Also, I want to warn you that the island’s webcams, like most other live webcams in Thailand, during the night can not boast of high image quality due to insufficient illumination. In addition, in the dark, many of Koh Samui Web camera switches to black and white mode that makes viewing them with even more uninteresting. Therefore, all those who would like online observe the life on the island, I recommend to keep in mind the possible differences in time and that the sunset on Samui comes early enough. And you must remember that after sunset this island almost immediately plunges into darkness. Somewhat better is the case with Web cameras, which are installed in places with good artificial light, for example, on the streets of Koh Samui, on the territory of some hotels on the island and in certain entertainment establishments. Recent often allowed to observe the life at the resort after dark without any discomfort for you. On the page of each of the webcams directly under the window of broadcast, you can find a brief description of the location on the island, where the camera is installed. There you can see the information on working time of this webcam Koh Samui, and some features of a particular camera. Map of Koh Samui hotels at the best prices! I draw your attention that the broadcast video stream with most cameras begins immediately after loading a new page. At the same time, in some browsers to enable viewing, you should press the virtual button “Play” (triangle). After it video mode will begin uploading, and after a short time (usually a few seconds), you can see live video from the island. If for any reason it is not activated window, I recommend to refresh the page and try to start the event with the selected Koh Samui webcam again. If this does not work, you can try a different browser. Often problems play video from web cameras facing the owners of mobile devices (smartphones and tablets). working on the latest versions of Android, which by default does not support playback of Flash-Videos. For myself, I have this problem successfully solved, so anyone interested – please, i can help. Also i want recall you that the majority of webcams with free access number distorts the image. This is especially noticeable in the daytime on the cameras, image transmission from the beaches and panoramic images of terrain. Usually, there is some loss of brightness, making even a sunny day at the spa appears darker than it really is. In some situations, such as when you want to see the weather in Thailand is now, using a web camera, a distortion of the brightness is able to mislead you when you do not know about the characteristic features of a web camera. For your convenience, almost all webcams Koh Samui you can expand to full screen by clicking on the bottom right of the player on the corresponding virtual button. With the lack of high speed internet connection, you may need to wait up to a minute to load the video stream, because now all the webcam Koh Samui work in high-resolution mode. 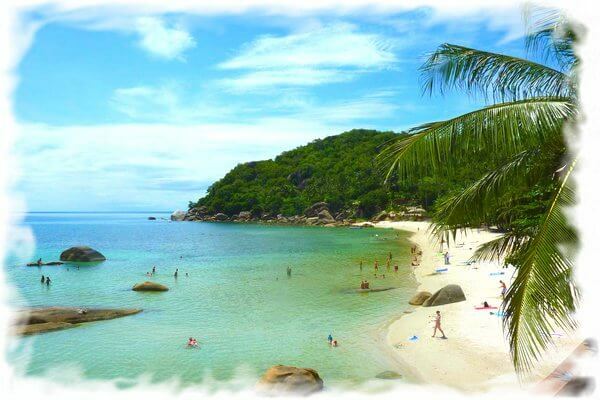 Webcam Koh Samui – see the palm trees and beaches of the island! Now directly about live webcams of Koh Samui. For more faster downloading video and for save traffic, each webcam placed on a separate page. It allows everybody to go directly to the camera, which is the most interested in at the moment. To do this, simply select one of the area and click the link next to it. Also was organized carousel principle for the convenience of visitors: a single click on the arrow above the webcam, go to the next one. And for those who do not want to view all webcams, under each webcam has a link to this page, where you can quickly select any of live webcams Ko Samui from the list. Thank you for the organization of broadcasting samuiwebcam! The newest webcam on Koh Samui (Thailand), which will allow us to see in real time a stretch of coast on the south-east coast. The main distinguishing feature of this webcam is its rotary mechanism. Thanks to that, we can see much more, because the webcam Samui periodically changes the camera angle and make zoom. Banyan Three Samui Resort it is five-star hotel has a large private area and a small detached beach in the northern part of Lamai Beach. The beach is not very big, but very picturesque and its size is enough for all hotel guests and rare guests from outside. Since the webcam is installed on a hill, it can see almost the entire hotel area and the site of the Gulf of Thailand in this part of Koh Samui. The most popular webcam Koh Samui is set in the hotel’s Crystal Bay Beach Resort and this live webcam broadcasts an image of one of the island’s best beaches – Laem Nan Beach, which is located in a small bay between the more well-known tourist destination Chaweng Noi and Lamai Beach. A good place web cameras installed in hotel Crystal Bay Beach Resort allows everyone to enjoy the beautiful views of the traveling waves on the shore. By the way, the special structure of the bottom of the beach allows you to see a rather rare phenomenon for the island, when the waves begin to curl and foam at a distance from the shore. This webcam is installed on territory Crystal Bay Yacht Club, which is situated on one of the cleanest and most beautiful beaches of Koh Samui. At this beach only three hotels, but only Crystal Bay Yacht Club has its own swimming pool where you can swim in the rare days, when on the beach is too great waves for swimming in the sea. Webcam installed in the southern part of the beach, however, the lens gets almost all the territory of the beach. This means that in real time you can see not only the wide beach next to the hotel Crystal Bay Yacht Club, but also the central part of the beach area in front of a low-cost hotel Silver Beach Resort (I lived just in it). And in the background you can see buildings Crystal Bay Resort Hotel and huge fragments of rock on the shore, which makes the beach so picturesque. This web camera installed on the territory of Villa Moon Shadow, therefore webcam provides a broad overview of the Gulf of Thailand and the coastline of Koh Samui. Webcam installed in the area of Chaweng Noi, but at some distance from the sea – on a high hill, which is completely overgrown with coconut palms and other tropical greenery. I added a broadcasting of this web camera to the site due to the fact that it provides a fairly clear idea about the weather on the island of Koh Samui. After all, a webcam has good color and demonstrates not only the state of water in the Gulf of Thailand, and the sky over the eastern part of the island. If you look closely, at the foot of the hill you will notice the road that runs through the entire beach of Chaweng. 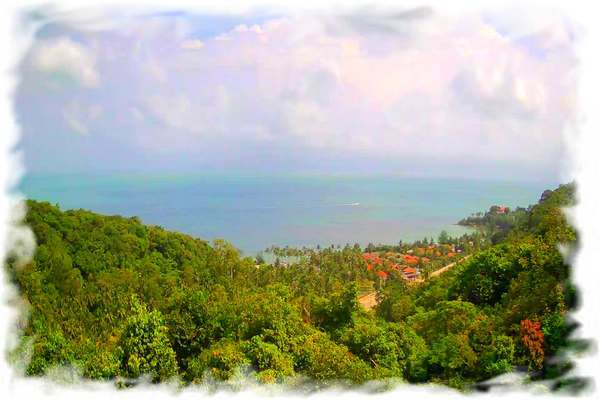 Another webcam Koh Samui is located on the north coast, one of the highest hills of the resort. Such an arrangement does not allow to enjoy the beaches and located directly on the coast of tropical trees, but it allows you to enjoy the magnificent sea view and picturesque villas and bungalows, immersed in the greenery of the island. Thanks to high-quality color reproduction and good resolution web camera, it can help to see the weather on the island in real time, as well as to evaluate the amount of precipitation during the rainy season in Thailand on Koh Samui, which starts on the island towards the end of the year. 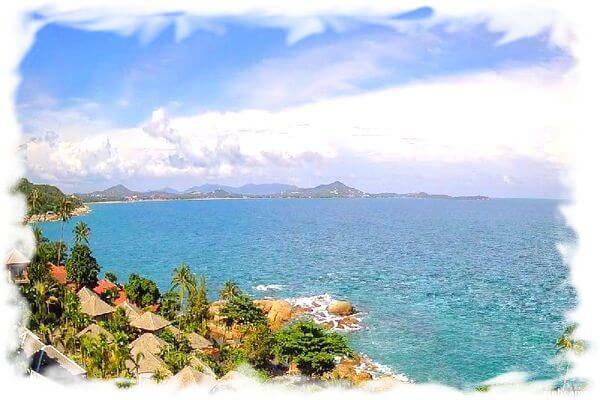 The original webcam Koh Samui, located in a complex of villas Vikasa Yoga on the rocky shore between Chaweng and Chaweng Noi. This webcam is installed high above sea level, so with it you can see a very large part of the eastern coast of the island. Also, with this webcam, you can quickly and easily assess the weather situation at the resort. More precisely, you can only see the weather on the east coast of Koh Samui, because the weather in different parts of the island can be quite different and you have to get used to it: it is often somewhere in the rain and on a nearby beach the sun shines brightly. I really like this webcam Koh Samui. I can even say that it is one of the most beloved. 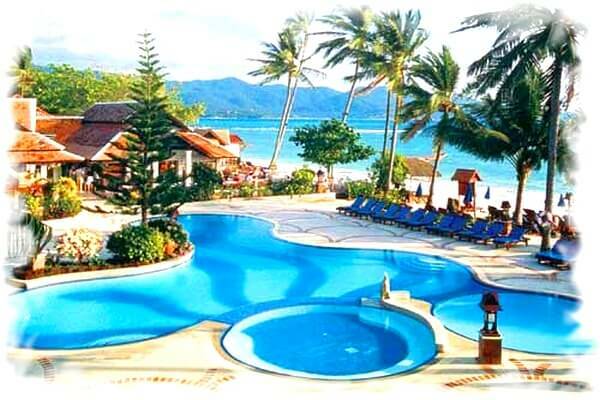 New webcam Koh Samui, which is set high on a hill in a gray-western part of the island, the hotel Santi Thani. 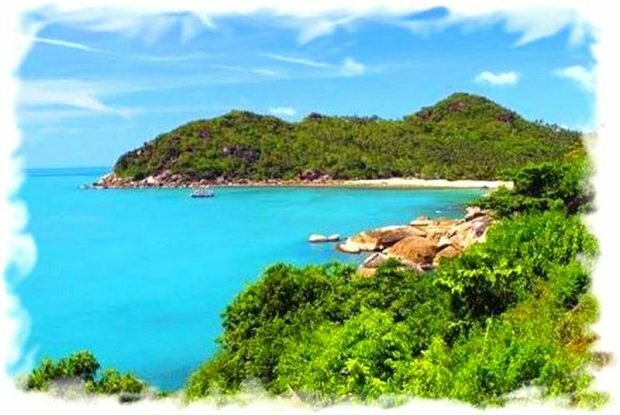 Scenic view, which opens out, comprises a large portion of the Gulf of Thailand, including located nearby Koh Samu but not yet lived-and a not yet so popular island of Koh Phangan (Thailand). By the way, on the pages of Thai-Rest.com you can also find the best webcams Ko Phangan. 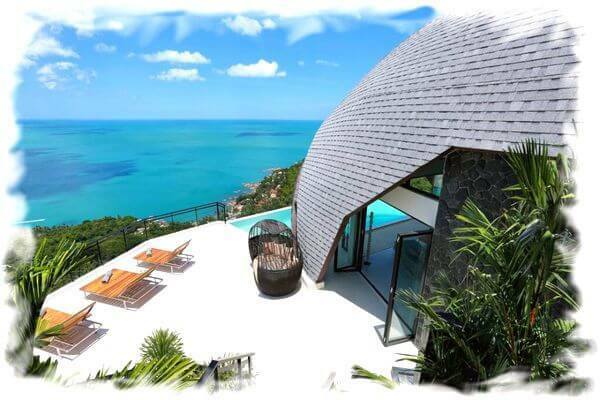 In the foreground of the Samui webcam can be seen beautiful villas and bungalows on the slopes of a steep hill, steep footpaths, and that is the norm on the tropical island of Koh Samui, a lot of coconut trees and other exotic trees. Very quality webcam Koh Samui, installed in Сhaweng Buri Resort Hotel, allow online to enjoy the territory of the said hotel, which is located in a very convenient location on the island – on the first line in the center of the most popular and large Chaweng Beach. On the front web camera plan can be seen the original form pool, which is located practically on the beach. Next to the pool – comfortable chairs and umbrellas, where you can comfortably relax in the periods when the waves on the beach is too dangerous for swimming, as it happens in the rainy season in Thailand on the island or temporarily there is not very good weather. The webcam provides live broadcast from Irish bar-restaurant called Tropical Murphy’s. 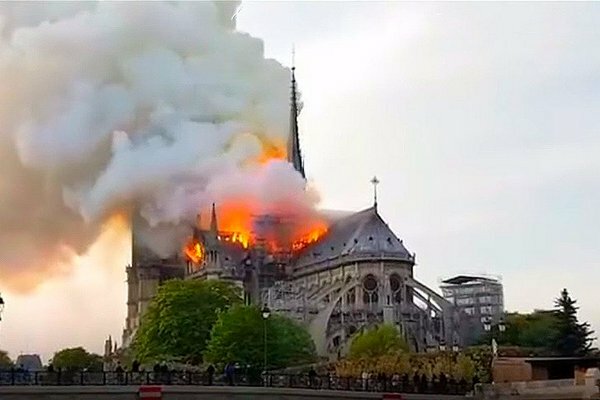 In 2016 view from webcam was replaced. Earlier in the foreground were several round bar tables, which usually employed-European visitors. Also earlier you could see motorcycle parking along the street at the bar and part of the roadway, traffic on which in the evening is enlivened considerably. 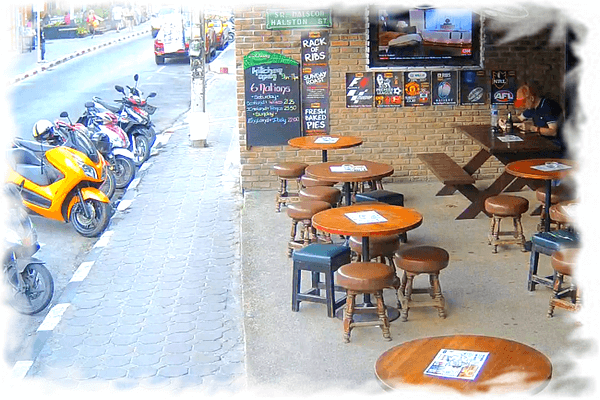 And as visitors in the bar during the day was a little, watch this webcam Koh Samui was more interesting only after dark. But in present time you can see a lot more at any time of the day. Moreover, this is one of the few webcams of the island, which can be viewed around the clock and at any time of the image will be clear and detailed. 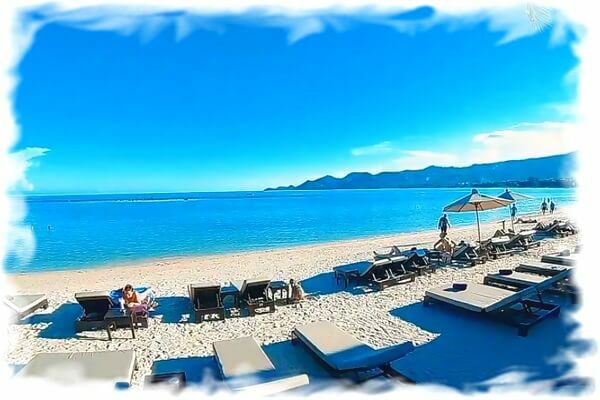 One of the newest webcams Ko Samui, located in the area of Lamai Beach, which by its popularity and infrastructure in present time second, but only little bit less popular than more crowded and noisy Chaweng beach. 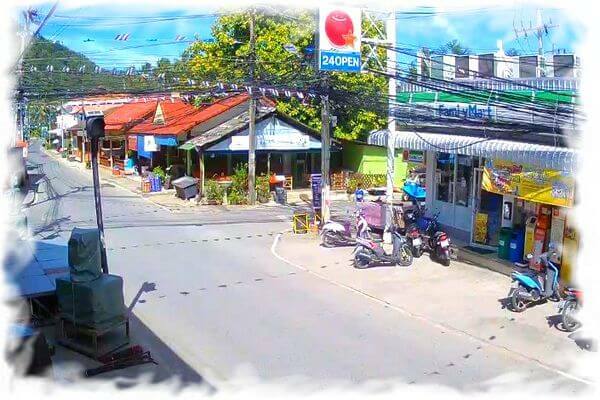 This webcam is installed not simple on one of the streets of the village of Lamai on Koh Samui, but its very busy street – Walking Street. As with other resorts in Thailand, Walking Street this place is the main nightlife: bars, discos, shops and nightlife in general the center of all the nightlife on Lamai Beach. On the front plan web camera Lamai Walking Street can be seen the popular convenience store Family Mart network in Thailand. 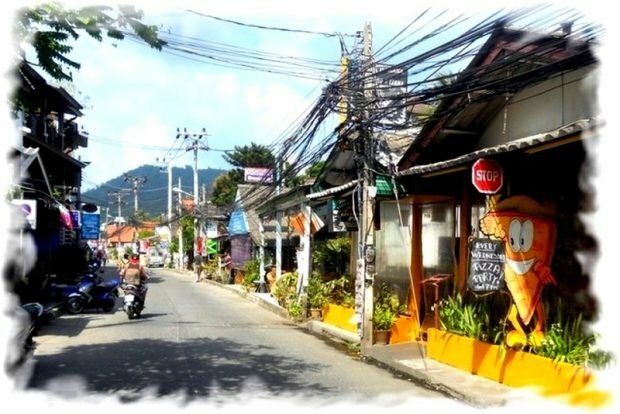 Another interesting live webcam Koh Samui, located on the street with numerous bars near the village of Lamai on the eponymous beach of the island. The webcam is set near the nightlife center of this beach outside the east coast of Koh Samui, so it’s always interesting to watch what is happening. Most of the day with this webcam you can see that this area of ​​the island is quite busy – there is a road and there is always traffic, as well as many pedestrians. At night, due to lack of natural light, you can see in detail only what is happening near the web camera, but in the light time of day you can see much more. For example, on the right, in the foreground of this webcam, you can see one of the convenience store of the most popular in Thailand shopping network Seven Eleven. A new live webcam on Koh Samui, which allows you to see in real time one of the largest and most popular nightclubs – Green Mango. This nightclub is located in one of the main nightlife centers on Koh Samui, so the entire street on which this nightclub is located is also called Soi Green Mango. However, nearby there are other nightclubs – clubs and beer bars, which are also very popular with tourists and local residents. 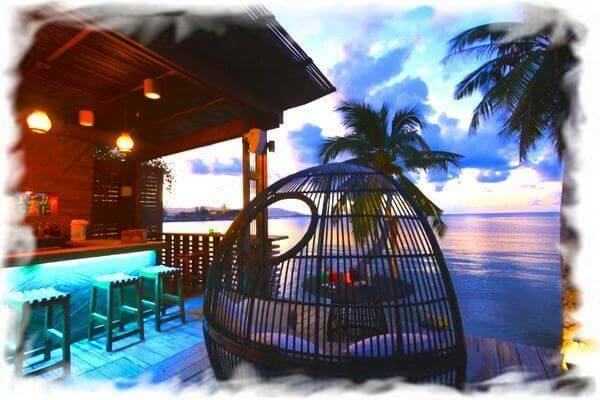 At the same time, many nightly establishments on Soi Green Mango have very original interiors and unique concepts. 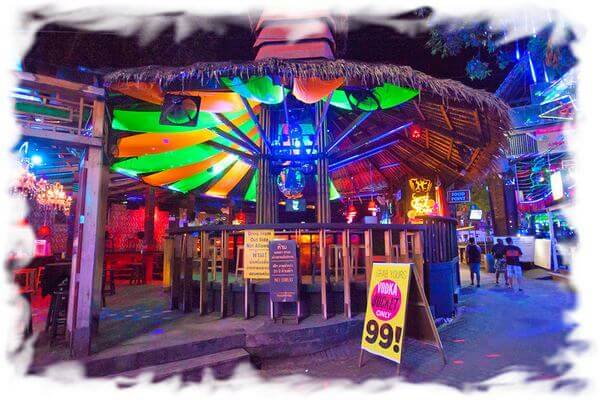 For example, in the interior of the Green Mango Club on Samui, the idea of ​​this large tropical tree is traced, surrounded by several bar racks and dance floors on several levels. This webcam Samui is located on the facade of another popular holiday destination – a cafe with the original name of Sweet Soul. Another new webcam in Thailand on Koh Samui, which allows everyone to see in real time a small street of Green Mango and entertainment facilities located on it. The webcam is installed on the facade of the Sweet Soul nightclub (you can read about this club in the description of the previous webcam) and is turned towards the main resort street – Chaweng Beach Road. Soi Green Mango is very narrow lane and, as a rule, it is used only as a street for pedestrians and motorbikes. 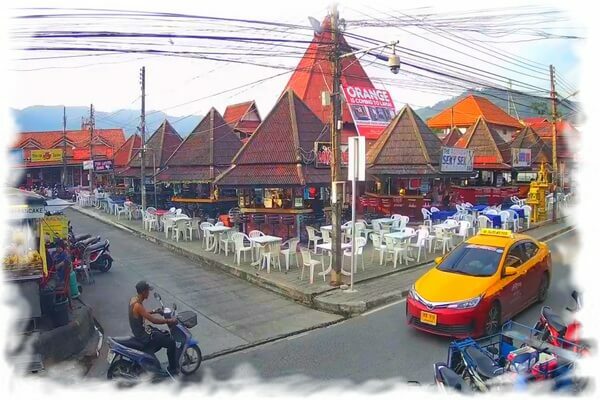 However, cars that serve nightlife on the street, can also be seen with this webcam Koh Samui in the daytime. By the way, unlike a number of other online cameras on the island, webcams on Soi Green Mango are better to watch after sunset on Koh Samui, or even better – after 22:00 hours in Thai time. New original webcam of Koh Samui island in Thailand, which allows everyone to see in real-time the most popular beach of this tropical island – Chaweng beach. The webcam is located in the eastern part of Samui, about one kilometer from the airport. Since the webcam is located almost on the beach, it allows you to admire the beautiful Chaweng Beach. You can see beach chairs, soft white sand and beautiful sea in the area of ​​Koh Samui. And since this webcam is located on Chaweng Beach, i.e. on the east coast of Samui, the camera is perfect for watching the island dawn in real time. Unlike some other Samui webcams, this camera does not always work around the clock, sometimes only during daylight hours (from dawn to dusk in Thailand). 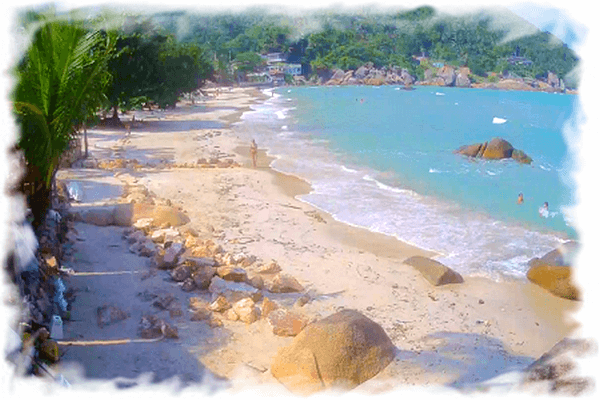 This new Samui webcam is located in the northeastern part of the island, in the Bangrak beach area. The main part of this beach is located a bit to the west, on the other side of one of the main attractions of Koh Samui – the Big Buddha statue. You can see this gilded monument with the help of this webcam in the left part of the playback window. 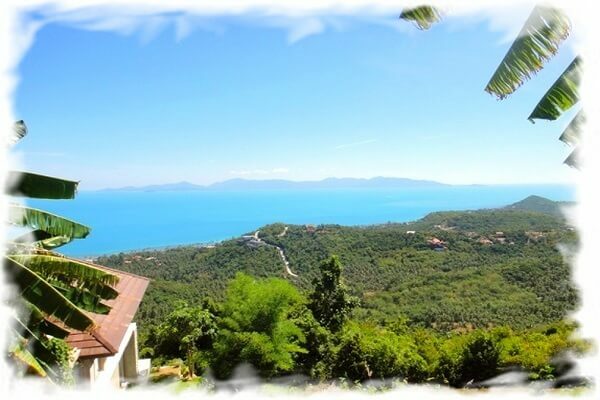 Since the webcam is directed to the north-west, with its help we can see a large portion of the Gulf of Thailand in the Samui region, as well as part of the mountain range in the northern part of this island. In addition, there are small islands located a few kilometers from Samui, which are also visible on the horizon. To start the broadcast, you must click on the arrow in the center of the screen. The place where this webcam is installed is Tango Lux Beach Villa – 4-star hotel on the first line. Unfortunately, some interesting webcams Ko Samui stopped broadcasting at the beginning of 2016. It was webcams from several hotels in the north and east of the island, the webcam from the popular Chaweng Beach. Also now you no longer find Samui webcam from Starz Cabaret, with which previously it was possible to see a beautiful show of transvestites on the island. Therefore I removed the inactive webcams from the page. I hope this is temporary. Also in the near future you can find here webcams Koh Samui from Lamai Beach. Stay tuned and enjoy!